Floating like an island in a Coral Sea, our spacious and modern, dual level platform provides the ultimate in facilities for reef viewing and relaxation in all weather and wind conditions. 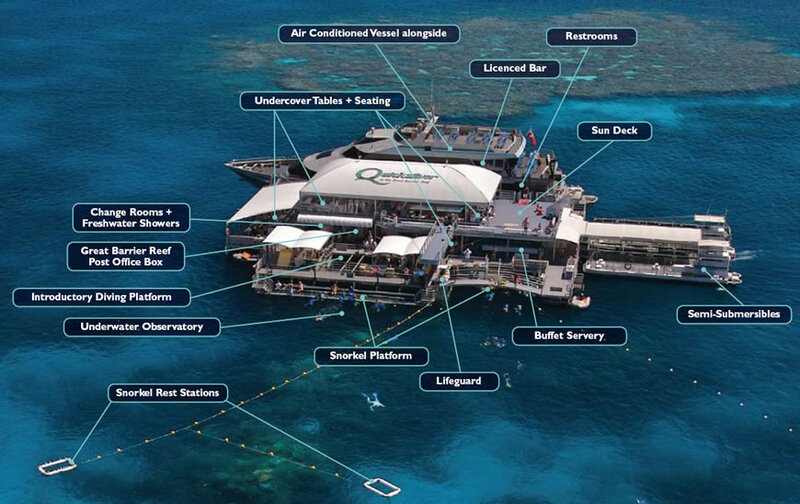 Situated on the very edge of the Great Barrier Reef, Agincourt Reef provides a sheltered anchorage for the Quicksilver vessel and the perfect spot for passengers to snorkel, dive, and view the spectacular coral formations and exotic marine life from the semi-submersible vessels. 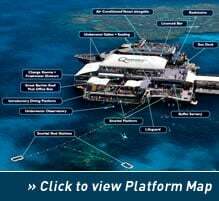 You can also see the corals and watch the fish feeding from Quicksilver’s unique viewing platform and underwater observatory located directly in front of the platform. From here, you can also view “first time” divers taking part in introductory dives. On the spacious decks, enjoy lunch in the undercover seating or in the air-conditioned comfort of the vessel. Semi-submersibles – cruise as often as you like! For guests confined to a wheelchair, our specially designed water powered lift allows for easy access into the snorkel pool where they can swim directly off the lift's chair into the weightless environment of the reef to snorkel and explore at their own pace. For a special souvenir, you can even send a postcard postmarked with the world’s only Great Barrier Reef stamp, from the only post box on the Great Barrier Reef!